The noted theater and film producer David Brown has called composer/lyricist Jerry Herman "the Irving Berlin of our time," thanks to the songs he wrote for such beloved musicals as Hello, Dolly!, Milk and Honey, Mame and La Cage aux Folles. 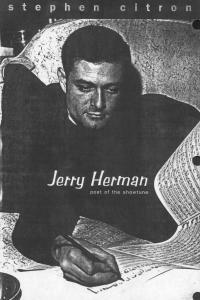 Now Yale University Press has released JERRY HERMAN, POET OF THE SHOWTUNE, the first major biography of Herman, who first began picking out melodies on a piano in 1937, when he was six years old, and is still doing the same nearly seventy years later. Written by Stephen Citron, a specialist on the American musical theatre, the book not only deals with Herman's life but lays bare his creative gifts, revealing how he writes his music and lyrics, backed up by specific examples from each of his shows and revues. Citron does all of this with much skill, exercising masterful control of complex musical ideas and notations. Herman, who was born in New York and was exposed to musical theatre by his parents, was encouraged in his work by the distinguished composer Frank (Guys and Dolls) Loesser. Herman, still a teenager, played and sang some of his songs for Loesser, who not only approved of them but gave him a lesson in writing showtunes. "A song is like a freight train," Loesser confided. "It has to have a lcomotive or hook--and the whole body of the song has to follow that. They all have to go where the locomotive is going. And then comes the most important thing, the red caboose that ends the song with a twist, a little surprise." "Herman never forgot the lesson of that afternoon," writes Citron. "Many of his lyrics get their sense of locomotion from the title and proceed with a sense of inevitability that inhabits them from beginning to end." Herman also learned a lot about musical theatre while attending the University of Miami in Coral Gables, where he not only wrote and directed shows but led the orchestra as well. Within a few years of graduation, he was writing cabaret shows in New York, an experience that segued into his first big Broadway hit, Milk and Honey, a musical set in Israel. Citron devotes full chapters to each of Herman's successive musicals, detailing not only his triumphs but failures, such as Dear World, a musical based on Giradoux's The Madwoman of Chaillot. Citron also paints a portrait of Herman that reveals his flaws and weaknesses as well as his many admirable qualities (such as his warmth, unpretentiousness and loyalty to friends). Today, while waiting for his latest musical, Miss Spectacular, to open in Las Vegas, Herman gives his time and support to a program aimed at bringing free live musical theatre to college students. He also funds many charitable causes, especially those which help the scourge of AIDS, a disease he himself has survived. Herman is a national treasure who has been done proud by Citron's expert and engrossing biography.